We arrived in Calgary by following Google Maps cycling directions (which are in beta, the app warned us). The directions took us on a 15-km gravelly road through First Nations land. Despite the huge NO TRESPASSING sign, nobody kicked us out although Maria was very worried. Incidentally, Maria’s tire had gone flat again, and we had to stop a few more times to inflate it. As we later found out, the culprit was the other half of the staple-like thing that caused the first flat. After that, Google took us onto a network of amazing off-street bike trails extending along the shores of the Bow and Elbow rivers. The paths are divided into two bike lanes (one in each direction) and are in perfect shape with not even one crack in the pavement. We heard these paths get the snow cleared off in the winter and many people continue to ride year-round. Go Calgary! In general, Calgary has a great bike route network with on- and off-street cycle paths covering much of the city. From what we saw, lots of people were on bikes, with many velo-connoisseurs on high-end road and racing speed machines. It’s thunderstorm season, and although we were originally planning to stay in Calgary for only a couple of days, we decided to take a few extra days to avoid foul weather. So our dear Calgary friend, Katia, took us on a CONS (Calgary Outdoor NutS) trip to Dewar Creek Hot Springs (yes, back in BC). After a series of spectacular failures we finally ended up in some hot springs, although we had to settle for Fairmont, a resort-style hot spring. 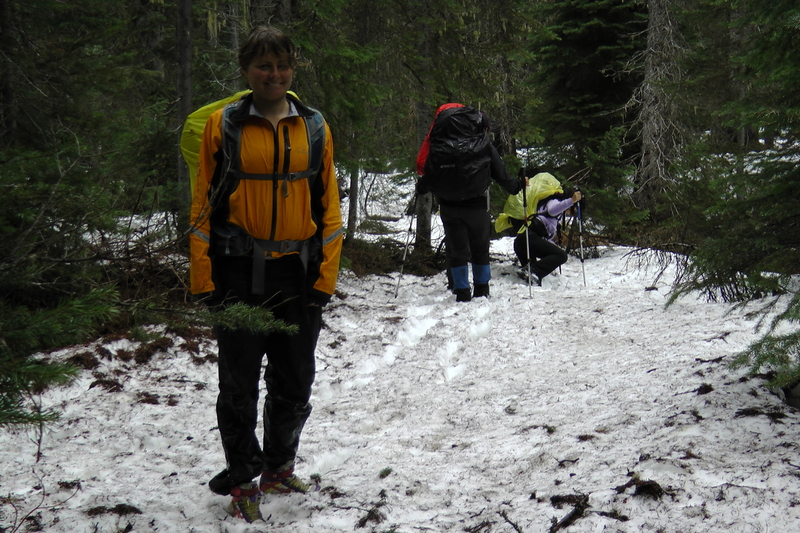 Spectacular failure #3: unexpectedly high snow cover on trail. Once a hot spring gets commercialized like that I don’t know how “natural” you can call it, for me it feels as natural as bottled water. The energy required to run the resort is probably an order of magnitude greater than the benefit of using naturally heated hot spring water. Nonetheless, Fairmont is doing their best and they did provide us with some much needed relaxation, so no complaints there. We also talked to the trip organizer, Trevor, about his perspective on sustainability. He brought up the issue of diet. “If everybody ate like I do right now,” Trevor admits, “there wouldn’t be enough food in the world.” He doesn’t eat most grains for health reasons, and therefore ends up eating a lot of meat. Since Trevor grew up on a cattle farm in Saskatchewan, he certainly knows his steak, and how resource-intensive it is to produce. Even taking the eating local philosophy into account and the abundance of cows in Alberta, meat intensive diet is not sustainable. Welcome to Calgary! Are you doing any speaking engagements on this trip? Any in Calgary by chance? We don’t have any public engagements planned, but it doesn’t mean it won’t happen. But also we left Calgary on Monday already, so if it happens it would have to be further east. Also, what were spectacular failures #1 and #2??? Also, these “velo-connoisseurs” are popping up in Seattle and I’m against it! Yes, actually they did start a curbside recycling program in Calgary! One of the people in the house we were staying at mentioned that it only started recently. As for “velo-connoisseurs”, that’s not meant as a derogatory term. As Dwight the Cyclist told us, “If more people had nice bikes, more people would cycle.” If someone wants to spend big bucks on something showy, well, for a bicycle it actually makes a difference in the riding experience, so why not! These paths are very cool! Alberta is so flat, even I could bike there. 🙂 And finally, the Calgary-Dewar Hot Springs puzzle is solved!